Poster for performances of Vasily Kamensky, David Burlyuk and Vladimir Mayakovsky in Kiev, 1914. 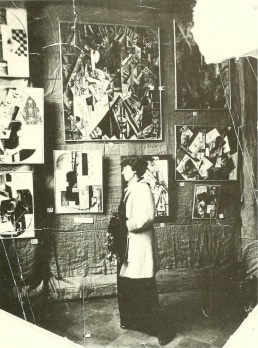 Alexandra Exter in front of Nadezhda Udaltsova's paintings at the exhibition The Store, Moscow, March/April 1916. Second Spring Exhibition of OBMOKhU, Moscow, May/June 1921. El Lissitzky, Prounenraum [Proun Room], Great Berlin Art Exhibition, May 1923. Arseny Avraamov, Symphony of Sirens, Moscow, November 1923. The steam 'Magistral' and the conductor on the roof are visible. 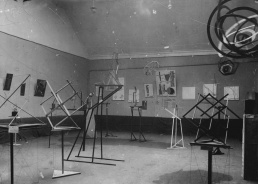 Nikolai Kulbin (St. Petersburg), Alexei Kruchenykh, Arseny Avraamov, Mikhail Larionov, Natalia Goncharova, Kazimir Malevich (Moscow/Petrograd), Wassily Kandinsky (Moscow/Weimar), Naum Gabo (Moscow/Berlin), Vladimir Tatlin (Moscow), El Lissitzky (Moscow/St. 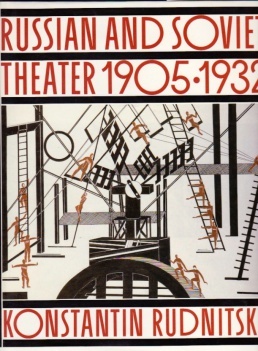 Petersburg/Vitebsk), Alexander Rodchenko (Moscow), Varvara Stepanova, Alexandra Exter, Lyubov Popova, Olga Rozanova, Nadezhda Udaltsova, Mikhail Matyushin, Wladimir Baranoff-Rossine, Stenberg brothers, Karl Ioganson, Gustav Klutsis. Hylaea (Moscow, *1910), Blue Rose (Moscow, 1906-08), Union of Youth (St Petersburg, 1909-17), Knave of Diamonds (Moscow, 1910-17), Donkey's Tail (c1910-13), Ego-Futurists (St. Petersburg, *1911), Tsentrifuga futurist group (Moscow, 1913–17), Supremus (1915-16), Zhivskulptarkh (1919–20), OBMOKhU (at IZO, 1919–22), UNOVIS (at Vitebsk Art School, 1920–22), Projectionists (Moscow, 1921–25), Factory of the Eccentric Actor (FEKS) (Petrograd, 1921–26), October (Moscow, 1928–30). Velimir Khlebnikov, Daniil Kharms, Vladimir Mayakovsky, Aleksei Gastev, Sergei Tretyakov, Lilya Brik. Dziga Vertov, Yelizaveta Svilova, Sergei Eisenstein, Esfir Shub. Vesnin brothers, Moisei Ginzburg, Konstantin Melnikov, Nikolai Ladovsky, Iakov Chernikhov. Vladimir Markov (Voldemārs Matvejs), Mikhail Matyushin, Nikolay Punin, Osip Brik, Pavel Florensky, Aleksei Gan, Nikolai Tarabukin, Boris Arvatov. IZO Narkompros (Moscow, *1918), INKhUK (at IZO, 1920–24), GINKhUK (St. Petersburg, 1923–27). Vitebsk Popular Art Institute (1919–22), VGIK (*1919), VKhUTEMAS (1920–26), RAKhN (Moscow, 1921–30, from 1925 GAKhN), VKhUTEIN (1926–c30). 0.10 (St Petersburg, 1915), Tenth State Exhibition: Non-Objective Creativity and Suprematism (Moscow, 1919), OBMOKhU exhibitions (Moscow, 1919-21), 5x5=25 (Moscow, 1921), First Russian Art Exhibition (Berlin, 1922). More: 1917, 1918, 1919, 1920, 1921, 1922-58, abroad 1917-74. The Russian Utopia, a depository of almost 500 architectural projects from the last 300 years. Poshechina obshestvennomu vkusu, 1912, Log. Nikolay Punin, Pamyatnik III internatsionala. Proyekt khud. E. Tatlina, 1920, PDF. Nikolai Tarabukin, Ot mol'berta k mashine, 1923. Cover by Antonina Sofronova. Sadok sudey [Садок Судей], St Petersburg: Zhuravl' [Журавль], [Apr 1910], 131 pp, JPG, IA, HTML. Poshechina obshestvennomu vkusu. V zashchitu svobodnogo iskusstva. Stikhi, proza, stat'i [Пощёчина общественному вкусу. В защиту свободного искусства: Стихи, проза, статьи], by David Burliuk, Nikolai Burliuk, Alexander Kruchenykh, Wassily Kandinsky, Benedikt Livshits, Vladimir Mayakovsky, and Viktor Khlebnikov, Moscow: Georgy L. Kuzmin, Dec 1912. 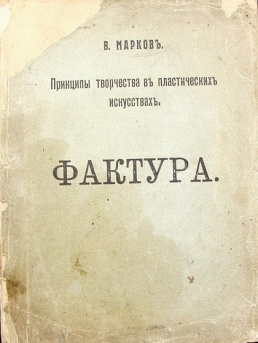 Sadok sudey 2, Moscow: Zhuravl' [Журавль], 1913, HTML, WS-RU. Pobeda nad solntsem [Победа над Cолнцем], by Alexei Kruchenykh, et al., Moscow, 1913. Strelets [Стрелец], 3 vols., Petrograd, 1915, 1916, 1922. Futurist almanac. 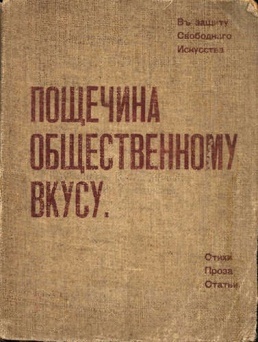 Vladimir Mayakovsky, Pro eto [Про это], Moscow/Petrograd: Gosizdat, 1923, 43 pp. Works by Kruchenykh – Khlebnikov – Mayakovsky. 145 books of Russian Futurism, 1910-1930, at GLIB Moscow,  – 19 books of Russian Futurism, in HTML – MoMA's 2002 online exhibition – Getty's 2008 online exhibition – Getty's 2016 online exhibition. Vladimir Markov, Printsipy tvorchestva v plasticheskikh iskusstvakh: Faktura [Принципы творчества в пластических искусствах: Фактура], St Petersburg: Soiuz molodezhi, January 1914, 70 pp. Alexander Bogdanov, Iskusstvo i rabochiy klass [Искусство и рабочий класс], Moscow: Proletkult, 1918, 79 pp. Nikolai Tarabukin, Ot mol'berta k mashine [От мольберта к машине], Moscow: Rabotnik prosvesheniya, Jul 1923, 44 pp, edition of 2000. Review: Arvatov (Lef 1923). Moisei Ginzburg, Stil' i epokha [Стиль и эпоха. Проблемы современной архитектуры], Moscow: Gosizdat, 1924, 238 pp. Excerpts. Commentary: Khan-Magomedov (1996). Viktor Shklovsky, O teorii prozy [О теории прозы], Moscow/Leningrad, 1925; 2nd ed., Moscow: Federatsiya, 1929, HTML, PDF; new ed., Moscow: Sovetskii pisatel, 1983, 384 pp, HTML. Iakov Chernikhov, Konstruktsiya arkhitekturnykh i mashinnykh form [Конструкция архитектурных и машинных форм], Leningrad: Leningradskoe obchestvo arkhitektorov, 1931, 232+ pp, 30 х 21.3 cm, edition of 5150. Selected articles on music and technology. Selected covers of the journals Lef and Novyi Lef, PDF, HTML. Mir iskusstva [Мир искусства; World of Art], St Petersburg, 1898-1904. Vesy [Весы. Научно-литературный и критико-библиографический ежемесячник; Libra], ed. Valery Bryusov, Moscow, 1904-09. Symbolist magazine. Zolotoe runo [Золотое руно; Golden Fleece], ed. N.P. Riabushinskii, Moscow: Riabushinskii, 1906-10. Symbolist monthly. Apollon [Аполлон; Apollo], Moscow, 1909-17. Trudy i dni [Труды и Дни], Moscow: Musaget, 1912-16. Symbolist magazine. Ocharovannyi strannik [Очарованный странник; Enchanted Wanderer], 10 numbers, ed. Victor Khovin, St Petersburg, 1913-16. Futuristy: pervyy zhurnal russkikh futuristov [Футуристы: Первый журнал русских футуристов], one double-issue, eds. Vasily Kamensky and David Burliuk, Moscow: Mysl, 1914. Iskusstvo kommuny [Искусство коммуны; Art of the Commune], 19 numbers, eds. Osip Brik, Nathan Altman and Nikolay Punin, Petrograd: IZO Nakrompros, 1918-19. Spolokhi: literaturno-khudozhestvennyy zhurnal [Сполохи: Литературно-художественный журнал], 21 numbers, eds. A.N. Drozdov (1-14) and E.A. Gutrov (15-21), Berlin, 1921-23. Jar-Ptitza [Жаръ-Птица; Fire-Bird], 14 numbers, ed. A.E. Kogan, Berlin (1-13) and Paris (14): Kogan, 1921-26. 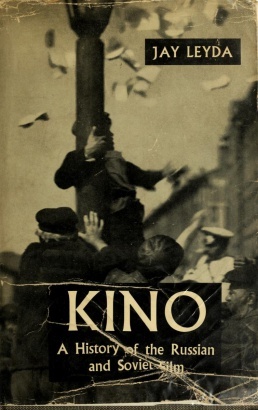 Kino-fot: zhurnal kinematografii i fotografii [Кино-Фот. Журнал кинематографии и фотографии], 6 issues, ed. Aleksei Gan, Moscow: Gan, 1922-23. Gostinitsa dlya puteshestvuyuschih v prekrasnom [Гостиница для путешествующих в прекрасном; Guesthouse for Travellers in the Beautiful], 4 issues, ed. N. Savkin, Moscow, 1922-24. Imaginist poetry magazine. Perevoz Dada, 13 numbers, ed. Sergei Sharshun, Berlin and Paris, 1922-49. LEF [Леф], 7 numbers, eds. 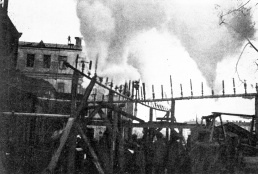 Osip Brik and Vladimir Mayakovsky, Moscow/Leningrad: Gosizdat, 1923-25. Russkoye iskusstvo [Русское Искусство], 3 numbers, Moscow: Tvorchestvo, 1923. Sovremennaya architektura [Современная Архитектура; Modern Architecture], 30 numbers, eds. Moisei Ginzburg and Vesnin brothers (1926-28), Roman Khiger (1928-30), Moscow: OSA, 1926-30. 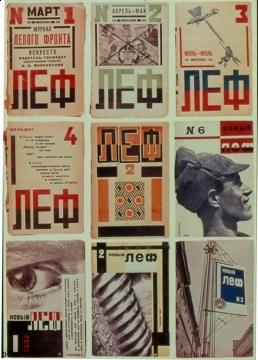 Novyi LEF [Новый Леф; New Lef], 24 numbers, eds. Vladimir Mayakovsky and Sergei Tretyakov, Moscow: Gosizdat, 1927-28. 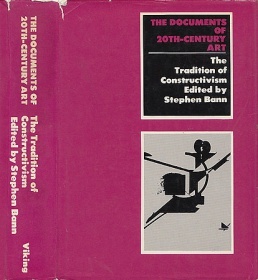 The Tradition of Constructivism, ed. Bann, 1974, Log, IA. 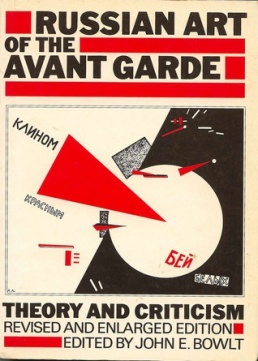 Russian Art of the Avant-Garde: Theory and Criticism, 1902-1934, ed. Bowlt, 1976, Log, IA. 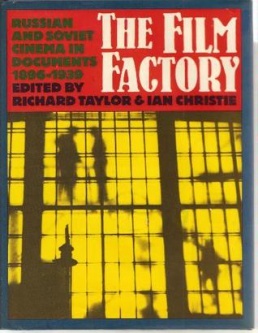 The Film Factory: Russian and Soviet Cinema in Documents, 1896-1939, eds. Taylor & Christie, 1988, HTML. 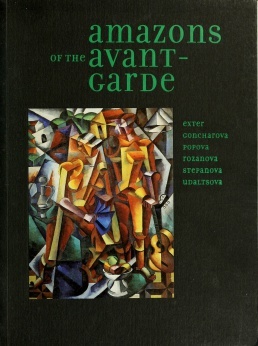 Art of the Avant-Garde in Russia: Selections from the George Costakis Collection, Guggenheim, 1981, IA, Guggenheim, Log. The Great Utopia: The Russian and Soviet Avant-Garde, 1915-1932, Guggenheim, 1992, IA. Amazons of the Avant-Garde: Exter, Goncharova, Popova, Rozanova, Stepanova, Udaltsova, Guggenheim, 2000, IA, Guggenheim, Log. 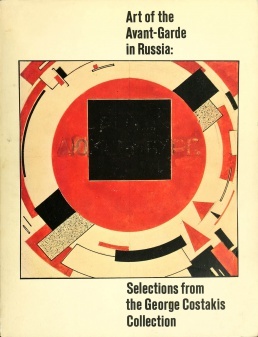 The Russian Avant-Garde Book, 1910-1934, MoMA, 2002, Log, PDF (72 mb), MoMA. Wood, Paul, "The Politics of the Avant-Garde", pp 1-24. Rakitin, Vasilii, "The Artisan and the Prophet", pp 25-37. Sharp, Jane A, "The Critical Reception of the 0.10 Exhibition. Malevich and Benua", pp 38-52. Shatskikh, Aleksandra, "Unovis. Epicenter of a New World", pp 53-64. Shatskikh, Aleksandra, "A Brief History of Obmokhu", pp 257-265. Lodder, Christina, "The Transition to Constructivism", pp 266-281. Adaskina, Natalia, "The Place of Vkhutemas in the Russian Avant-Garde", pp 282-293. Lavrentiev, Aleksandr, "What Is Linearism", pp 294-297. Gassner, Hubertus, "The Constructivists. Modernism on the Way to Modernization", pp 298-319. Kovtun, Evgenii, "The Third Path to Non-Objectivity", pp 320-328. Lebedeva, Irina, "The Poetry of Science. Projectionism and Electroorganism", pp 441-449. Douglas, Charlotte, "Terms of Transition. The First Discussional Exhibition and the Society of Easel Painters", pp 450-465. Barnett, Vivian Endicott, "The Russian Presence in the 1924 Venice Biennale", pp 466-473. Dzhafarova, Svetlana, "The Creation of the Museum of Painterly Culture", pp 474-481. Tupitsyn, Margarita, "Fragmentation versus Totality. The Politics of (De)framing", pp 482-496. Compton, Susan, "The Art of the Soviet Book, 1922-32", pp 609-621. Lobanov-Rostovsky, Nina, "Soviet Porcelain of the 1920s. Propaganda Tool", pp 622-633. Douglas, Charlotte, "Russian Fabric Design, 1928-32", pp 634-648. Rakitin, Elena, "How Meierkhold Never Worked with Tatlin, and What Happened as a Result", pp 649-664. 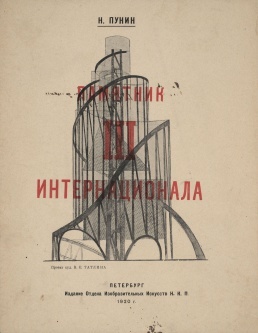 Strigalev, Anatolii, "Nonarchitects in Architecture", pp 665-679. Cooke, Catherine, "Mediating Creativity and Politics. Sixty Years of Architectural Competitions in Russia", pp 680-715. Volume I, 479 pp. incl. 247 col. pls. and 116 b&w ills. 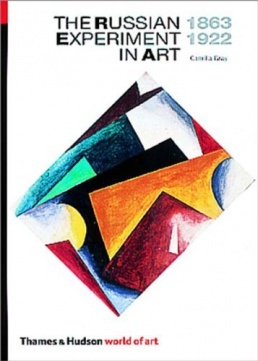 five introductory essays followed by 73 short texts on the work of specific artists. Volume II, 239 pp. incl. 251 b&w ills. 36 essays on aspects of architecture, literature, theatre, film and music. Volume III, compiled by Hubertus Gassner, 367 pp. 354 short texts of the period 1894-1994 by artists, critics etc., in German translation. Volume IV, 99 pp. Biographies; selected bibliography; list of exhibited works; index. Deborah Wye, "Art Issues/Book Issues: An Overview", pp 10-23. Nina Gurianova, "A Game in Hell, hard work in heaven: Deconstructing the Canon in Russian Futurist Books", pp 24-32. 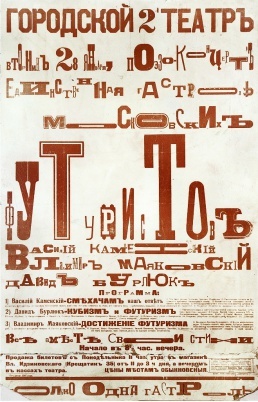 Jared Ash, "Primitivism in Russian Futurist Book Design 1910–14", pp 33-40. Gerald Janecek, "Kruchenykh contra Gutenberg", pp 41-49. 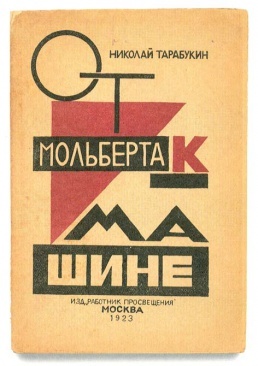 Margit Rowell, "Constructivist Book Design: Shaping the Proletarian Conscience", pp 50-59. Camilla Gray, The Russian Experiment in Art, 1863-1922, 1962, Log. 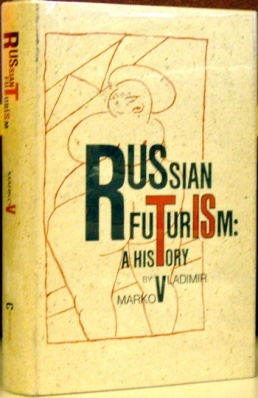 Vladimir Markov, Russian Futurism: A History, 1968, Log. 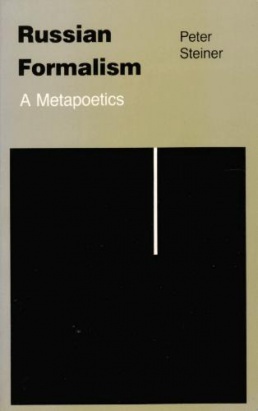 Peter Steiner, Russian Formalism: A Metapoetics, 1984/2014, HTML/PDF, Log. Jay Leyda, Kino: A History of the Russian and Soviet Film, 1960, IA. Lilya Kaganovsky, The Voice of Technology: Soviet Cinema's Transition to Sound, 1928-1935, Indiana University Press, 2018, 271 pp. 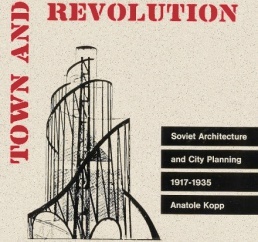 Anatole Kopp, Town and Revolution: Soviet Architecture and City Planning, 1917-1935, 1967/1970. 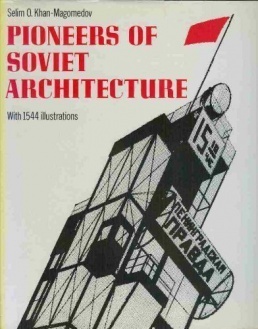 Selim O. Khan-Magomedov, Pioneers of Soviet Architecture, 1983/1987. Konstantin Rudnitsky, Russian and Soviet Theater, 1905-1935, 1988. 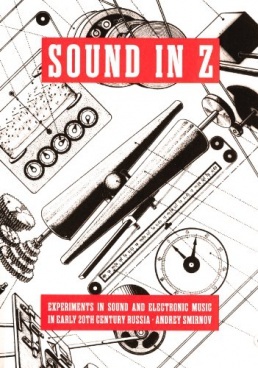 Andrey Smirnov, Sound in Z: Experiments in Sound and Electronic Music in Early 20th-century Russia, 2013, Log. Margarete Vöhringer, "Choks, Reflexe, Asja. Zu Benjamins 'Vertiefung der Apperzeption' im russischen Avantgarde-Film", pp 201-210. 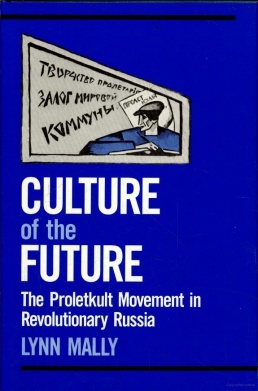 Lynn Mally, Culture of the Future: The Proletkult Movement in Revolutionary Russia, 1990, HTML. Galina Orlova, "'Voochiyu vidim: fotografiya i sovetskiy proyekt v epokhu ikh tekhnicheskoy vosproizvodimosti". Clare Cavanagh, "Pseudo-Revolution in Poetic Language: Julia Kristeva and the Russian Avant-Garde", Slavic Review 52:2 (Summer 1993), pp 283-297. Nikolai Izvolov, "The History of Drawn Sound in Soviet Russia", trans. James Mann, Animation Journal (Spring 1998), pp 54-59. Annemarie Jaeggi, "Relations between the Bauhaus and the Russian Avant-Garde as Documented in the Collection of the Bauhaus Archive Berlin", Heritage at Risk, Special Edition: "The Soviet Heritage and Europe Modernism" (April 2006). Konstantin Akinsha, Sylvia Hochfield, "The Faking of the Russian Avant-Garde", ARTnews, 1 July 2009. Nancy Perloff, "Mirskontsa (Worldbackwards): Collaborative Book Art and Transrational Sounds", Getty Research Journal 5 (2013), pp 101-118. 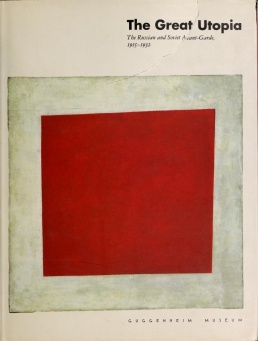 A Catalogue of Russian Avant-Garde Books 1912-1934 and 1969-2003, 2nd ed., London: British Library, 2006, 202 pp. Review. 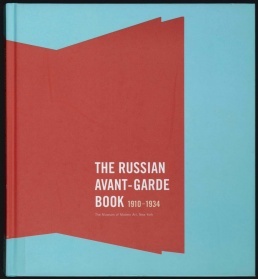 Russian Avant-Garde Artists’ Books 1969-2010 in the British Library. Aelita, Queen of Mars (1924), dir. Iakov Protozanov, based on the novel by Alexei Tolstoy (1923). Interplanetary Revolution (1924), dir. N. Khodataev, Z. Komisarenko, and Y. Merkulov. Animated film. Seth Graham (ed. ), Necrorealism: Contexts, History, Interpretations, Pittsburgh, 2001. Soviet cinema : film periodicals, 1918-1942. Part 1. Journals. "From Underground to Foreground: The Rise of Video Art in Russia", 1995. Anatoly V. Prokhorov, "Half a Kingdom for a Strange Horse! ", c2000. Lucie Buechting, "Carbon Club: On Russian Video Art", Art Margins, 2004. Videotochka, russian video art gallery, edition 2009. Michael Prosniakov, Musicologist, Founder and Director of Stockhausen Institute, Moscow. 1996 - Concert program for Lev Theremin’s 100 anniversary. 1997 - The Theremin Center. The Multimedia Concert Program at Russian Musical Academy, Moscow. This page was last modified on 22 March 2019, at 09:39. This page has been accessed 253,394 times.